Some people think that libraries are stuffy, tomb-like places run by bespectacled octogenarians whose primary function is to go around shhhussshing others. Those of us who actually work in one know that’s far from the truth. 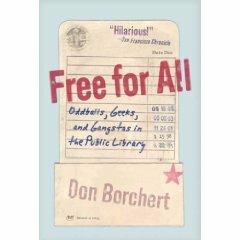 One book I found that really hit the nail on the head as far as how libraries today really operate is Free for All: Oddballs, Geeks and Gangstas in the Public Library by Don Borchert. Okay, it’s about a library in California, so some things are a little different, but it is still a quick read that’s delightfully funny, yet peppered with some very poignant moments. 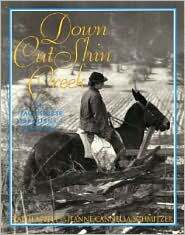 For a nonfiction take on the subject, check out Down Cut Shin Creek: The Pack Horse Librarians of Kentucky by Kathi Appelt and Jeanne Cannella Schmitzer. During the Great Depression, this WPA program was started to put women to work and to serve the very poor in remote regions of the country. These courageous book carriers provided their own horses or mules and were paid a whopping $28 a month! 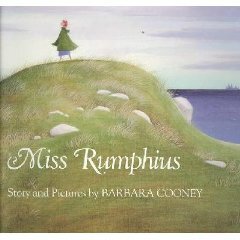 As far as children’s books, an old favorite of mine is Miss Rumphius by Barbara Cooney. Miss Rumphius, a retired librarian, plants lupines all over her community– in order to leave the world a better place. The message is touching and the illustrations inspiring — it’s a feel good book that just makes you want to go out and DO something!